I visited Pacific Senior Living in Peoria yesterday, where Mary Aime-Juedes RN, BSN, iRNPA, founder of RN Patient Advocates of Scottsdale spoke to a small local audience about patient advocacy. A delicious lunch was included at this free presentation. 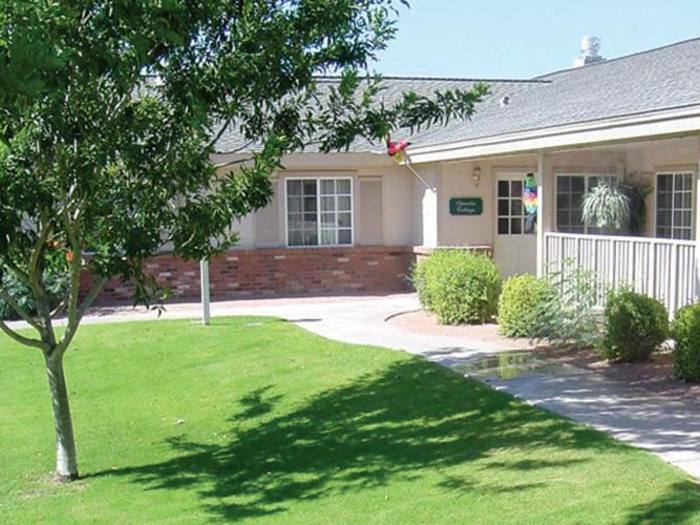 Pacifica Senior Living offers memory care units at two local facilities (Peoria and Paradise Valley,) with a noted Rediscovery Program developed by Encore Senior Living. The locked grounds are spacious, with plenty of shade trees and roomy covered porches, so residents can walk or gather outside at will and in comfort and safety. Aime-Juedes is an accomplished RN with 20 years experience in many fields including Workers Compensation and oncology. A graduate of the University of Wisconsin, Madison, she learned to be a patient advocate at UofA’s College of Nursing, along with three other students. There are, however, only two practicing patient advocates in all of Arizona, and a little over 50 in the entire U.S.
As a patient advocate, she oversees each client’s medical care and communication with caregivers. “I collect medical records and review them, back a minimum of five years,” she told us. “I have gone back as far as mid-’70’s records, though. In doing so, she has often resolved health care issues undetected til now, or observed medication problems that needed to be addressed. The latter happen regularly when patients have more than one physician and / or surgeon, and the various caregivers aren’t communicating. In one case the patient had assumed her surgeon had sent all her surgical records to her primary care physician. Aime-Juedes discovered that for three years those records had been delivered to the wrong PCP. Communication with your medical care team is vital, she told us. Aime-Juedes said that 35-40 percent of patients don’t want to contradict their doctor because they don’t want to be labeled a bad patient. But this is counterproductive, and could, in fact, be dangerous. “Prepare for your doctor appointments – write down your questions,” she said. She talked about her client, a 65 year old man who had moved from Houston to Arizona, and was suffering from a recurring cough. It was Aime-Juedes that determined the cough was due to a medicine he was taking unnecessarily. The medicine was eliminated. The man’s cough is gone. She also encouraged us to do our own research on medicines and procedures, cautioning that doctors not offering the latest procedures will not send a patient to others that do. Education is empowerment, Aime-Juedes explained. Another startling statistic – 98,000 deaths occur annually due to medical errors. “The best option is to not go to the hospital if you don’t have to,” she told us. State medical examining board – An alternative physician rating resource is RateMd. Consumer Health Ratings – Hospital quality comparison statistics. HealthGrades.com does so as well. The latter rates long-term-care facilties and rehab centers as well. The U.S. government’s Medicare.gov does the same.